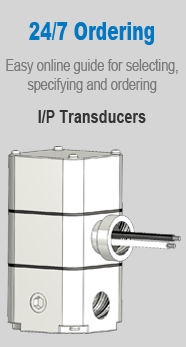 I/P transducers are electro pneumatic devices that reduces a supply pressure to a regulated output pressure, directly proportional to an electrical input signal. Pressure transducers control the output pressure with a two wire current or three wire voltage input. The regulated air pressure is used to control actuators, positioners, brakes, cylinders and other pneumatic equipment.